Baked in a regular cardboard/foil oven and reflectors of the type of María Telkes. We mix the yeast with the 1 spoon of sugar and ¼ cup warm water and let it react. We separate the dough in three parts to form 3 long, even strands. To start the braid pinch together the three strands and braid carefully. Create a braid and then round it into a "garland" unite both ends and place in a metal tray. Place it in the sun for 2 to 3 hours of clear lovely sun. Then enjoy it Guilt Free! 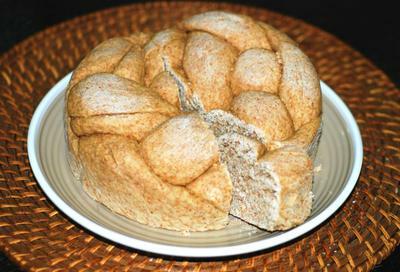 This bread is great for those in need of high fiber, low fat, low cholesterol, low sugar diet. Thank you LuzElena for another great recipe. This should surely be appealing to those who are watching their diets.